Always an attention getter, from 25 pounds for a small gathering to 100 pounds for a company party. We use only the best-of-the-best pigs, stuffed with your choice of kolbassi, chicken, or fruits and vegetables. Each pig is placed in our original Pig-Nic box to transport. The heart of our business is our family of hams starting from the finest corn-fed hogs to be found, we then trim them to your exact specifications, making our boneless hams 96% to 97% fat free. The next step is curing using maple sugar and our own special blend of spices. We then hang them in cotton nets and transfer them to our state-of-the-art smokehouses for cooking and smoking. Using only 100% pure hickory wood means no articifical or chemical smokes are used. Our hams are available in Boneless Baby Doll, Boneless, Semi-Boneless, Old-Fashioned, and Capicola. Whether it’s Sunday’s family breakfast, or a holiday grill-out, our sausages are the perfect choice. To start, our fresh sausages are made using the entire hog, not the leftover trimmings, which means you get the full flavor that you deserve. Our smoked sausages, which include Slovenian Sausage, Kolbassi, Hot Kolbassi, and Smoked Sausage with Cheese, bratwurst, knockwurst, chorizo, ondouille, and cevopcici are all made the original way with no fillers and natural hickory wood smoke. To top it off, try our SUPER DOGS. The name speaks for itself. A nine inch natural casing frankfuter with no fillers…so plump and juicy that one is never enough! 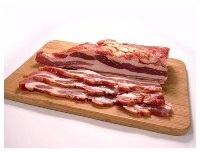 All of our bacon is dry-cured, the traditional way, the it is slow smoked over 100% hickory wood. We now offer our bacon in 5 flavors: original, hunky-style, black pepper, sweet vidalia, and jalapeno. 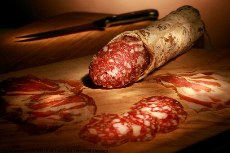 From soppresatta, prosciutto, capicola, and imported provolones and fontinella cheeses. Some products are made fresh here on location, and others are imported from Arthur Avenue in Little Italy, New York City. Our portion-cut steaks come from USDA Choice aged beef. Hand-cut and trimmed, our steaks are available in a wide variety of cuts, cut fresh daily from your selection. From the 16oz. Porterhouse (for the true steaklover) to a 5oz. Delmonico. We also offer gift-boxed steaks: USDA Choice individually vaccuum sealed…a great gift idea!